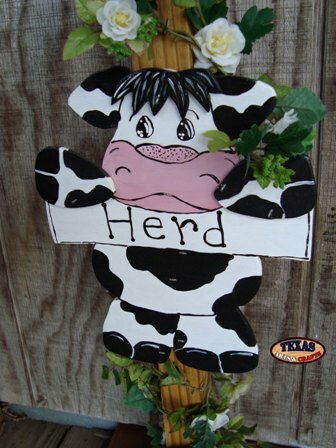 The dimensions for the cows are approximately 10.75 inches tall by 9 inches wide by .25 inches deep. 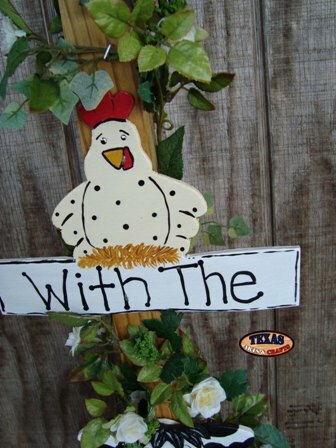 The dimensions for the chicken are approximately 6 inches tall by 9 inches wide by .25 inches deep. 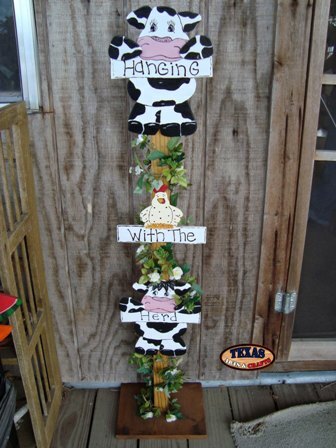 The dimensions for the post are approximately 48.50 inches tall by 11 inches wide by 9 inches deep. 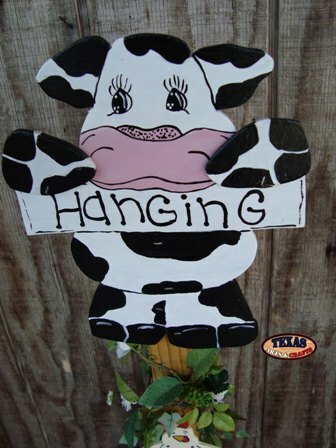 This sign weighs approximately 4.75 pounds with packaging. For the continental U.S. shipping and handling is included in the listed price. For shipping outside the continental U.S. please contact us through our Contact Us page. We build the Sunflower Candle Holder out of cedar in our workshop. 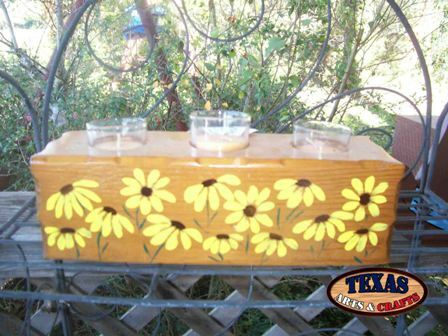 Sunflowers are hand painted onto the sides of the candle holder. The dimensions for the candle holder are approximately 4 inches tall by 12 inches wide by 4 inches deep. The candle holder weighs approximately 3.75 pounds with packaging. For the continental U.S. shipping and handling is included in the listed price. For shipping outside the continental U.S. please contact us through our Contact Us page. 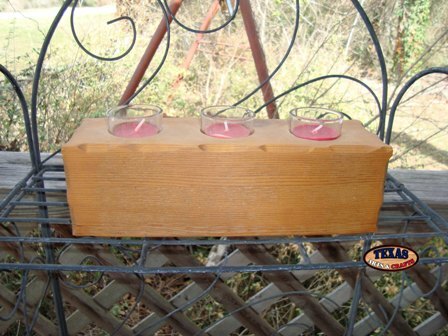 We build the Plain Candle Holder out of cedar in our workshop. 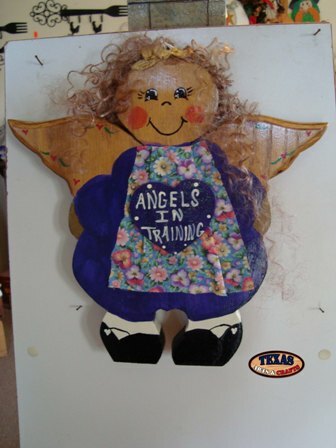 We build the Purple Angel in Training out of pine in our workshop. The angel is hand painted wearing a purple dress with black sandals. The dimensions for the angel are approximately 12 inches tall by 11.50 inches wide by .75 inches deep. The arts and crafts item weighs approximately 2 pounds with packaging. For the continental U.S. shipping and handling is included in the listed price. For shipping outside the continental U.S. please contact us through our Contact Us page. 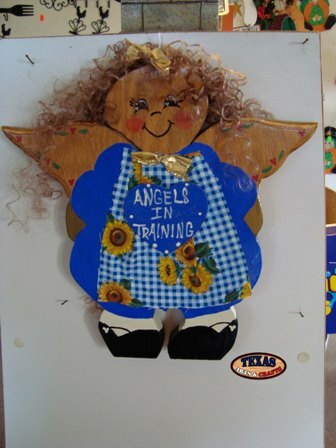 We build the Blue Angel in Training out of pine in our workshop. The angel is hand painted wearing a blue dress with black sandals. We build the Lamb Towel Holder out of pine in our workshop. 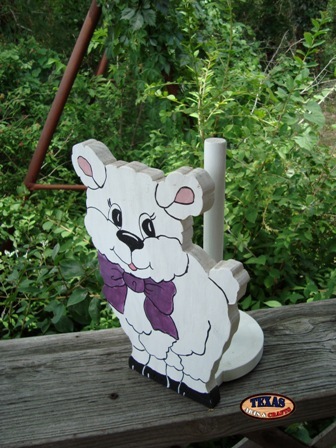 The lamb is hand painted white with a purple bow. The dimensions for the towel holder are approximately 11 inches tall by 8.75 inches wide by 6.75 inches deep. The towel holder weighs approximately 2.50 pounds with packaging. For the continental U.S. shipping and handling is included in the listed price. For shipping outside the continental U.S. please contact us through our Contact Us page.